This is a review and giveaway of the brand new Moby GO carrier from Moby Wrap, a new carrier designed just for carrying bigger babies and toddlers up to 45lbs. It is an adjustable, lightweight carrier perfect for wearing your baby or toddler on the go. This is a joint giveaway with Downside Up And Outside In and Natural Parents Network. You may enter at one site only. Please find the section marked “Win it!” for the mandatory entry and optional bonus entries. Moby Wrap is offering our readers a giveaway of the brand New Moby GO, a value of $79.95. The Moby GO is an amazingly comfortable, very adjustable front carrier for babies 15-45 lbs with cross-shoulder design straps, a padded waist belt, and easy to reach buckles. The Moby GO is a brand new carrier from Moby Wrap that is made specifically for babies 15-45 pounds. Moby Wrap is known for their soft, stretchy Moby Wrap, which offers a wonderful way to wear your baby from 8 to 35lbs. 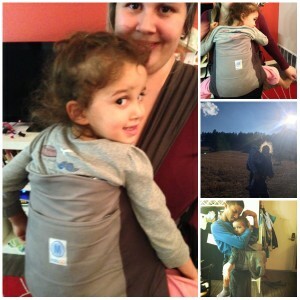 Now, Moby Wrap offers us the Moby GO carrier, designed for babies 15 to up to 45 pounds. The Moby GO is a wonderful, ultra lightweight, soft structured carrier that makes wearing bigger babies easier than ever. We tried out the Moby GO with our nearly five year old daughter, who is too tall for many other carriers at her age but still wants to be carried. A lot. And I must say, I tend to use carriers as much or more now than I did when she was a baby. A nearly five year old who predictably tires out on walks, hikes, and grocery shopping trips is, in my opinion, so much easier to wear than carry. The Moby GO comes in stylish black and grey, and has unique cross-shoulder strap design that distributes your child’s weight evenly, making it very comfortable on your back and shoulders. The straps are unpadded, but rest comfortably on both shoulders, making the wearer feel balanced under the extra toddler weight. The back panel comes up very high on your child’s back, and the base is very wide to support even older toddlers like my own. The carrier seat is designed to support your child properly as well. This carrier kept my daughter tucked in closer and feeling safe. The Moby GO has a pocket on the front with a matching (removable) hood tucked into it. The first time we wore the Moby GO, Little Berry had just caught a cold and wanted to be touching me constantly. I expected it to be tricky managing the straps that first time with a sick kid on my hip, but it was simple enough, even while supporting her with my other arm to cross the strap and slip her in. The straps cross in the back, which you can do by unbuckling one, slipping your little one in, then buckling the second strap, or by leaving both buckled, sliding over your shoulders and sliding your child in from the top. As soon as I got her in it, she wanted to nurse. Nursing in the Moby GO was easy and far more comfortable than I expected. The carrier straps adjust to be longer or shorter, and to nurse in it, I simply lengthened the straps so Little Berry was lower than usual, and then she leaned into my arm like a cradle while having milkies. I think with a younger child this would be a great use for the hood, as it creates a sort of cocoon and helps them relax and zone out from any distractions around them. One very nice feature is how adjustable the carrier is to the adult wearer: the waist buckle is able to accommodate very large adults and very small adults with a just few tugs on the straps. I am a women’s size 18, and my partner is a men’s XS, but we both wear our daughter interchangeably. With only three buckles to adjust, this carrier was very simple to switch between us with minimal fuss. I did notice that her size helped make it fit better on my partner, as he had it on the smallest size. 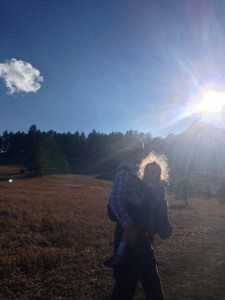 Babywearing is a wonderful way to keep your little one warm when it’s cold – something we really appreciate living in Colorado where the weather can change very quickly. When it’s eight degrees below zero we truly do tend to wear her more, if only to keep her off the cold ground, her feet dry from the snow, and her chest warm. The only downside for us was that the carrier is not designed for back carrying. However, I tried the carrier on my back and we did just fine. The straps ideally should be crossed in the front (which is tricky to do by yourself with a bigger child, so I suggest enlisting a helper with the buckles until you get the hang of it), but it is definitely possible to use in a back carry and is comfortable, even in our many layers of winter clothes. But the back carry did look and feel a bit funny as it crossed right over my chest. I would say for an older child this is probably the most popular way to wear them, and so I wore her around for about an hour to see if it would hurt my shoulders. We were both comfortable, and she does enjoy it more than being on my front (unless she’s nursing!). I also tried it with un-criss-crossing the straps and wearing her on my back, but after a while it felt like the straps might slide off my shoulders, so I don’t recommend wearing it that way for safety reasons. 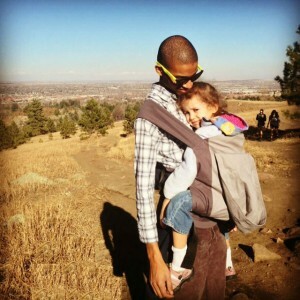 I truly feel that Moby GO is a wonderful carrier choice for anyone with a baby or toddler with adequate head support. It is affordably priced, and is adjustable to fit many different ranges of adults, so all care givers can enjoy it. It has a great back support panel so that even taller children, like my 3.5 foot almost five year old can be worn with ease and comfort. It is simple and convenient to nurse even bigger nurslings in, and it has a cute, cozy hood that slips into it’s own zippable front pocket when not in use or can be removed completely. The side buckles are easy to reach, and the extra wide carrier seat allows even heavier children plenty of support. The Moby Company also makes the Moby Wrap, a carrier designed for babies who don’t have great head support yet. The Moby Wrap is a wonderful soft wrap that you will love if your baby is still small. Like the Moby GO you can nurse in it, your little one can sleep in it, and you can wear it for non strenuous exercise like some yoga, walking, etc. They also offer an adorable mini Moby Wrap for toddlers to wear their dolls and stuffed animals in. Moby Wrap company is a wonderful advocate for parent-child bonding through massage, breastfeeding, babywearing, and has a wonderful easy-to-navigate website with details on bonding with your baby while wearing them, doing Yoga, and even Infant Massage in their carriers. You can purchase your own Moby GO at Moby Wrap and at Amazon. The Moby GO retails for $79.95 and is currently available in the US and Canada. For your own chance to win a Moby GO from Moby Wrap, enter by leaving a comment and using our Rafflecopter system below. MANDATORY ENTRY: Visit Moby Wrap and tell us another item you like! You must enter your name and email address in the Rafflecopter entry system for your entry to count, after leaving a comment on this blog post. 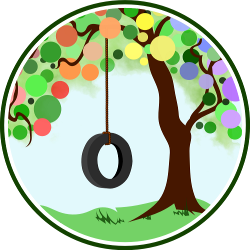 This is a joint giveaway with Downside Up And Outside In and Natural Parents Network. You may enter at one site only, and we’ll be recording IP addresses to ensure that there are no duplicate entries. That said, please do visit and enjoy both sites! Contest closes March 30, 2013 at 11:59 p.m. Eastern Time. Mamma Pie is a blogger, a mama, and a sewing fiend who enjoys staying at home unschooling with her Little Berry and exploring the great outdoors of Colorado with her partner, daughter, and their goofy dog. I have wanted a Moby Wrap for ages — I love the Best for Babes design! What, first comment? YES. I want this. Also excited to see that Moby has woven wraps! I like the striped ones. I’d love one of the Moby Blankets! I think Daddy would really like this carrier! I will be enjoying this with my new baby who is due in September. The organic wraps look fantastic. I’d use this with my soon-coming little one. I love the Moby knot hats- love to get one. My second baby due in August. I was just thinking about how convenient it would be to upgrade wraps to carry by 15 month old around when I take the dogs out – without having to worry about a bothersome stroller. This would be wonderful! for me and my 4 month old son. I want this so bad! I need a carrier that can hold my 3 year old. I also LOVE the knot hats on the Moby website! My daughter (and myself!) will enjoy the Moby Go. Would love to try this one! I like the cross shoulder design.